What follows is a two-part article: part one is about Robert Burns, Scotland’s favorite poet, and part two is about The Haggis Project. Burns is widely considered Scotland’s national poet and was at the forefront of the Romantic Movement. 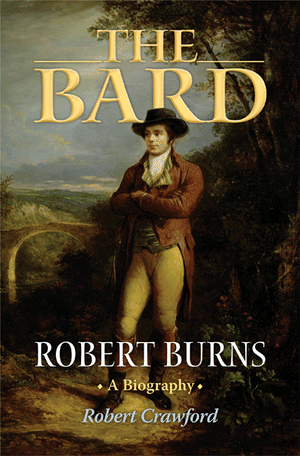 Burns wrote poetry in both Scots, a form of Gaelic spoken in Scotland, and English. In addition to his Romantic poetry, Burns was known for his political and civil commentary, and for writing and collecting folk songs. Burns Night is a celebration of the life and work of Robert Burns, and is held on 25 January each year (Burns’ birthday). One of the traditions of Burns night is to have a Burns Supper, involving traditional Scottish dishes and poetry recitations. The National Trust for Scotland Foundation USA has information and videos for how to organize your own Burns night, which can be found here. After dinner, two humourous toasts are made over a dram of whisky. ‘The “Toast to the Lassies” is given by a male guest to the women present. In the “Reply to the Laddies,” a female guest responds humourously to the earlier toast. 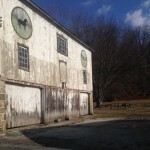 In search of the main ingredients for a Burns Night Supper, and looking forward to a road trip, I invited my sister, Michele, to join me for a leisurely drive to Berks County. We had great weather and bantered on about what would come to be known as The Haggis Project (or That Which Shall Not Be Named). 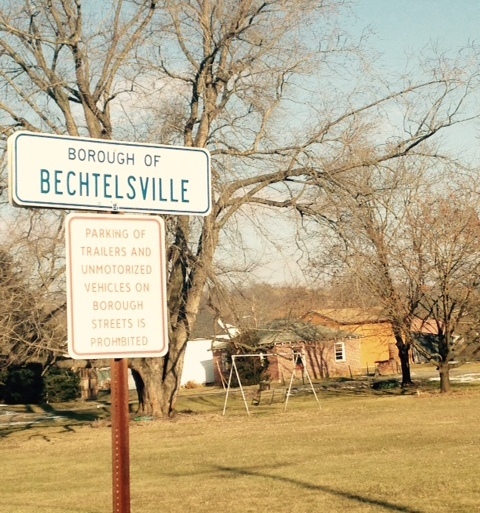 After passing through the village of Bechtelsville, which took a few seconds, we wound our way through hills and trees as the sun created shadowed landscapes. It was beautiful, even in winter. We could just as easily have been in the hills of Scotland. 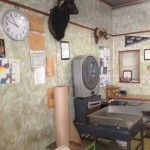 When we arrived, we found the Manieri Meats office and main building located next to the Manieri family home. 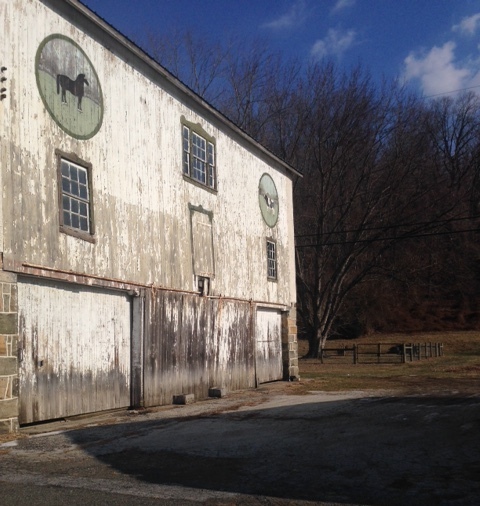 Across the street was a picturesque barn and behind the main building was a small waterfall. The Manieri family has been in business for four generations beginning with the first generation in Abruzzi, Italy. Stephen, Gwen, and their adult daughter, Lorena, were very open about all aspects of their business. A USDA agent, also very friendly, was on site the whole time. The Manieri’s only take advance orders by phone and don’t have a storefront for walk-in business. 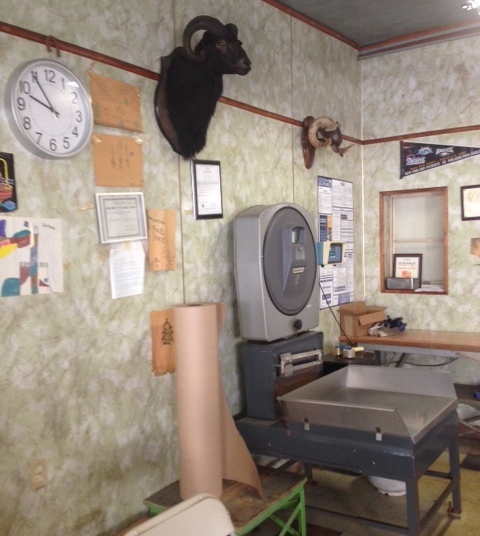 Visiting this small, family-owned operation in Bechtelsville was like seeing old friends. The office probably hasn’t changed much since Elmo Manieri started the business and the whole family seems to be on a first-name basis with their customers. We waited while another customer oversaw the handling of his order, ensuring that everything was done according to Dhabihah methods, and conforming to halal as dictated by the Muslim faith. 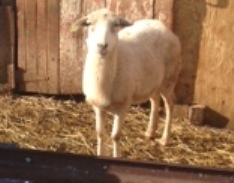 We named the sheep Bobbie. Now it was our turn. Lorena brought out my order of sheep stomach, heart, liver, and tongue. I’ll spare you the gory details. Luckily, I had brought along a cooler and we stopped for ice on the way back. When I got home, I wrapped the offal in Ziploc bags and stowed it in the fridge. 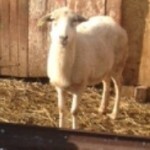 I had researched many recipes, read the history of Robert “Bobbie” Burns, visited websites on the history of haggis, and watched videos of other people making haggis, but nothing prepared me for the awful truth of handling sheep offal. My favorite video featured Chef Jochen Kern at the Berjaya University College of Hospitality, which ends with an authentic Scots recitation of Robert Burn’s Address to a Haggis. After all was said and done, I decided to loosely follow Alton Brown’s recipe with hints from other recipes when I thought it made sense or looked interesting. Little did I know that his parting words, “if you serve it at all,” would haunt me for days. Finding the other non-sheep ingredients wasn’t too difficult, but the only store to sell mace (the spice) was the Bhavani food market in Exton, Pa. Most authentic recipes call for sheep lungs, however, the sale of them is banned in the United States. The first step requires soaking the sheep stomach in heavily salted water overnight. Use a large plastic container with a tight-fitting lid and several tablespoons of kosher salt. The next day I rinsed the stomach several times with white vinegar and water. After you have soaked the sheep stomach overnight, start cooking the sheep offal in the largest stock pot you own. Fill the pot with water, or beef stock, add some kosher salt, and cook at a slow simmer for 2 hours. Save the strained broth; you’ll need it later. While the offal is simmering, start chopping the onions, measure the spices into small bowls, mince the suet, and toast the oats on a large baking sheet. Once the offal is finished simmering, remove it and let it cool. Most recipes instruct one to mince the offal, and one site advised using a meat grinder (who has a meat grinder at home? 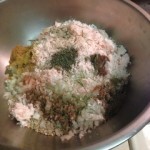 ), but one site, to which I am eternally grateful, suggests using a food processor. It works beautifully, breaking down the meat into more of a sausage texture. Using the largest bowl you own, combine all of the above ingredients, including the meat and about 2 cups of the broth you saved and, using your hands, mash it all together until it holds together a bit. Stuff the filling into the sheep stomach leaving enough space to either tie the stomach closed or stitch it closed with a chef’s needle and string. For the first time in my life, I used latex kitchen gloves. It was the only way I could bring myself to handle the sheep stomach. Using the same large stock pot, add fresh water or beef stock and simmer the haggis for 3 hours. Be prepared for an odor that will be reluctant to leave your nostrils. 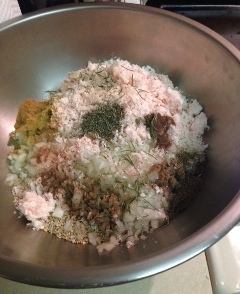 I even started a homemade potpourri on the stove. Truthfully, that only made matters worse. 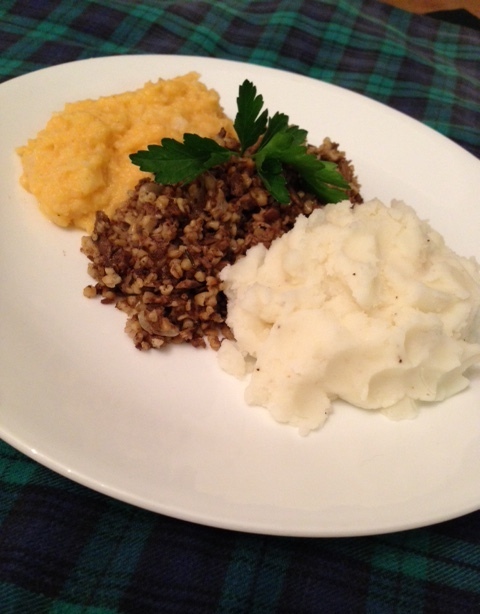 Serve the haggis with neeps and tatties (mashed turnips and potatoes). I know that Robert Burns and others toast the haggis with a dram of whiskey, but I toasted mine with a glass of Elderberry Black Ale. Bagpipes and drums are optional. 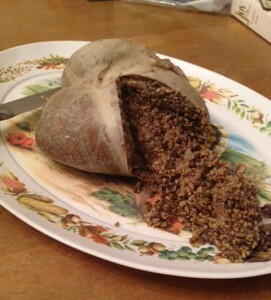 In closing, and in all honesty, I tasted the haggis and will probably never eat it again. My son-in-law, Mike, loved it. He’s right up there with Andrew Zimmern when it comes to food. www.RobertBurns.Org is also a great source for Burns information, and they too have a set of instructions for a Burns Supper. Robert Burns: The Poet and and Further Reading written by Sarah Wingo, Team Leader of Humanities II Liaison Team & Subject Librarian for English Literature and Theatre. Robert Burns: The Haggis Project written by Luisa Cywinski, writer on Communication & Service Promotion Team and team leader, Access Services.